I know, when did you ever think I'd write a post with 'sport' in the title. It can mean only one thing. It must be really important. Over 200 wonderful people joining together to make something amazing happen. This is Team Honk, 2014 styley. 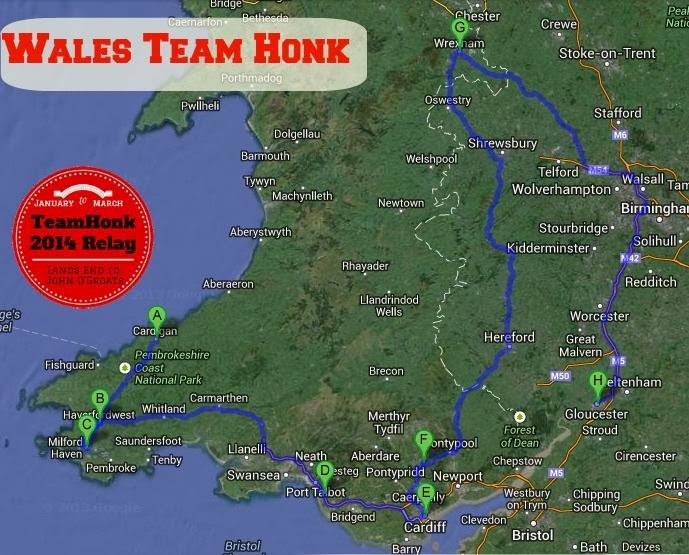 The Team Honk Blogger Relay started in Lands End on the 12th January 2014 and finishes in John O'Groats on the 23rd March 2014. Aiming to raise over £20,000 for Sport Relief, bloggers will travel the country by any mode of transport possible- pushchair pushes, roller blading across the Humber, boating round Bristol, #Honkopoly around London, fancy dress, onesies, bikes, scooters, planes, hiking, rafting and mountain climbing. #teamhonkrelay involves over 200 bloggers, their friends and families in a route that zig zags up the UK taking in 38 regional teams. Check out the route if you don't believe me! Because, from three bloggers, to 200, it's quite a tale. And yes, I get to be a small part of it. I get to join the amazing team of Welsh bloggers to get our baton to join the English effort and progress from Lands End and Haverfordwest to John O'Groats. And all part of Sport Relief. On Sunday 19th January, Rebecca from Mum of Three Boys will be travelling 22.2 miles from Cardigan to Haverfordwest to pass the baton to Claire from Diary of the Evans-Crittens. After running around Scolton Manor, Claire will get schools in Milford Haven involved with Sport Relif challenges. On Sunday 26th January, Claire from Team Honk Pembrokeshire will transport the baton 80 miles in Fancy Dress to Margam Park where she will pass the baton to me! and with children on tow we'll take responsibility for the baton and getting more people involved with Sport Relief. On Friday 31st January, the multiple take over will commence with Emily from Twin Mummy and Daddy, when two set of twins will engage in much merriment as they exchange the baton. Following on from this on Saturday 1st February, Emily will pass the baton onto Jo from Ojos World at Caerphilly Castle where running and pyjamas will rule the day. And from there the baton will travel all the way up to Wrexham where Cerys from Mascara & Mud and Claire from Six Degrees of Harmony will be in charge of getting the baton across the border to Team Honk England. So, what would I really appreciate from you? Well, I would be so grateful of your support! If you're reading this and you're Welsh, and more specifically in South Wales from 27th-31st January, you'll notice that's when the baton is making it's way from Barry to North Cardiff. If you're able to get involved, a sport club or group, an eager school, we'd love to hear from you. At the moment, my plan is this. 26th January: an overly enthusiastic handover with Claire at Margam Park, afterall I am much excited with calories to burn. For those who know me best, you know how much I like to delegate motivate others. And Mr J has agreed to cycle from Margam Park to Rhoose (26 miles!!). He's agreed to wear whatever can be worn with his cycle helmet and comfy pants. So please! If you have a particularly fantastic outfit or, like me, you can't imagine cycling this far. Neither can he! It's been at least three years. Please sponsor him (and us!). During the week, I am fortunate that Seren's school want to get involved, so expect much merriment from a primary school in South Wales. And Tom and Seb have decided the baton must cross the Cardiff Bay Barrage, so the family cycle with five bicycles, as three year old twins and a four year old do their bit for Team Honk, with mummy probably wobbling the most. And of course, the boys can't wait to pass the baton on to two beautiful girls as they meet Twin Mummy on the evening of the 31st. If you can please donate online or text HONK to 70005 and donate £5 to Sport Relief. That is an especially epic route! Well done everyone for their part in it and good luck!